but God chose the foolish things of the world that he might put to shame those who are wise. I don't know how you feel about today's promise, but when I read it, it puts a smile on my face. The thought that God has chosen the weak things of the world is very good news for me. 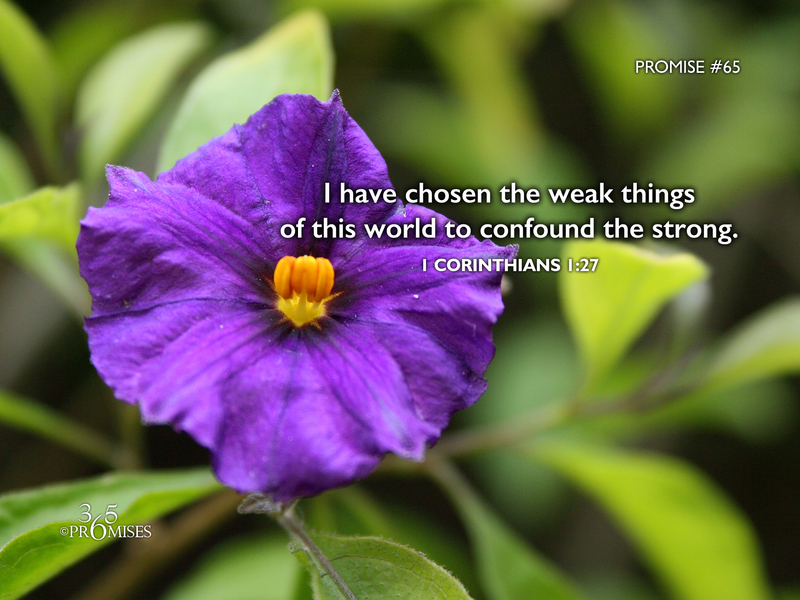 In the broader excerpt of this passage found in 1 Corinthians 1:26-31, we read how God has not only chosen the weak things to confound the strong, He has chosen the poor to confuse the rich and the foolish things of the world to shame the wise. The reason why I think this promise is such good news is that I believe that most of humanity falls within one of these categories... weak, poor or foolish. Jesus Himself told us that He did not come for the healthy (spiritually) but for the sick. If you take time to read the Beatitudes in Matthew 5:1-12, you will read that the gospel is really good news for those who are not naturally considered 'top of the food chain'. This is not to negate the rich, the strong and the wise, but it is definitely a way where Jesus elevates the poor, the foolish and the weak to the level playing field of the cross. Since we live in an upside down kingdom where the first will be last and the last will be first, let us always be reminded that when we are weak, His strength is perfected in us. (2 Corinthians 12:1-10).